The Hand of God – (north of the front door, in the Cry Room). 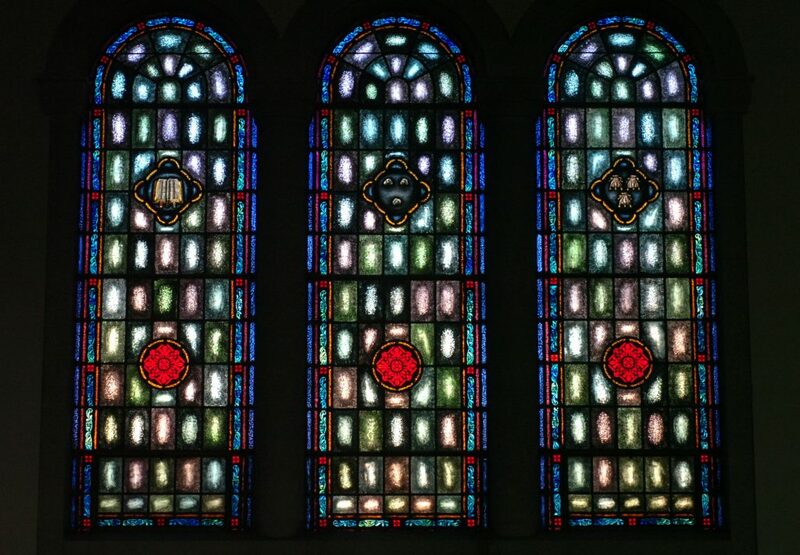 This window represents God the Father. It is very common to picture the Hand of God giving a blessing. The thumb and first two fingers are usually extended and the third and fourth fingers closed. 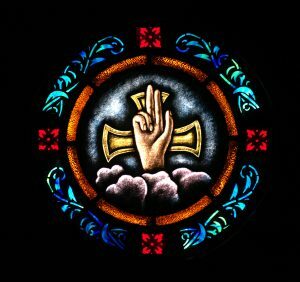 The thumb and two extended fingers represent the Holy Trinity; the two that are closed represent the two-fold nature of Christ. The Hand extends out from shining clouds, which are a sign of sanctity. The three gold rays that surround the hand identify it as the Hand of God. The Descending Dove – (south of the front door). 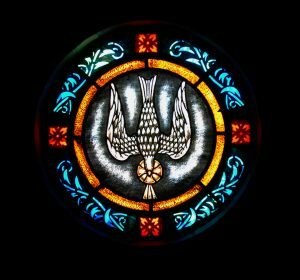 In sacred art, the descending dove is the most common symbol by far used to represent the Holy Spirit. This is one of the oldest and best of Christian symbols. 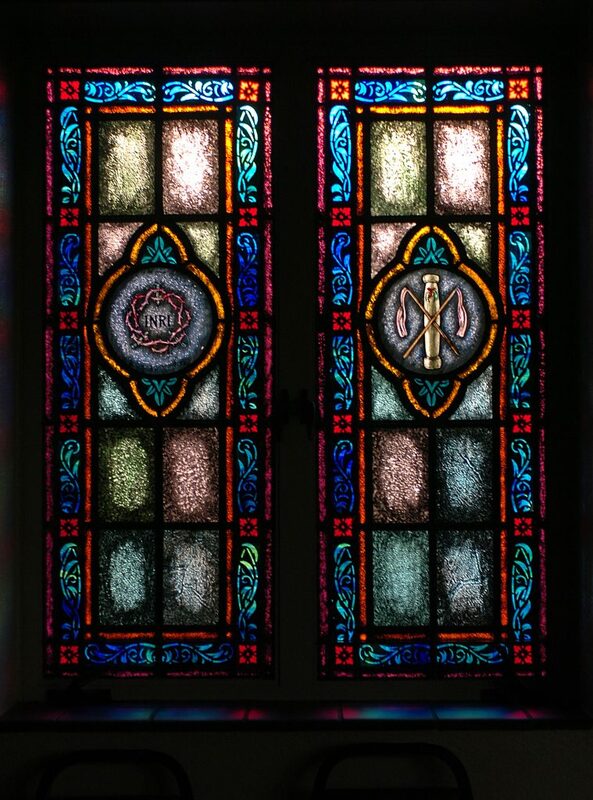 The Sacred Heart of Jesus – He is the Patron of our Church, the center of our lives, and of all things, and so this window has the central place in the front wall of our Church. St. Matthew – The winged man is the usual symbol of St. Mathew because his Gospel beings by tracing our Lord’s human descent. St. Luke – The ox represents St. Luke because his Gospel gives a very full account of the sacrificial death of our Lord. Oxen were an important part of the Old Testament laws of sacrifice. St. John – The symbol of St. John is the eagle because from first to last his Gospel soars on eagles’ wings to the very throne of Heaven. The Blessed Virgin Mary – (center window above the north confessional). The Mother of Jesus, with her Sorrowful and Immaculate Heart, shown holding lilies, a sign of her purity, with a golden halo of 12 stars (12, if we could see the ones behind her head – Rev 12:1). 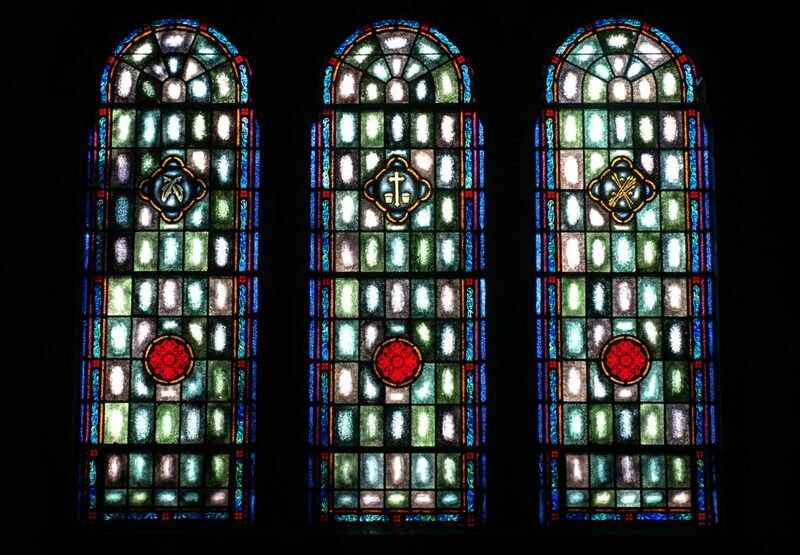 The Virgin’s Monogram – (right window above the north confessional). The five letters forming the word Maria are woven together. You can also find the letters of the Hebrew form of her name – Mariam. St. Joseph, the foster-father of Jesus – (center window above the south confessional). Copying the symbolism in the window of Mary the Immaculate one, this window shows St. Joseph with several lilies, representing the purity of the one who was chosen to be Mary’s spouse. 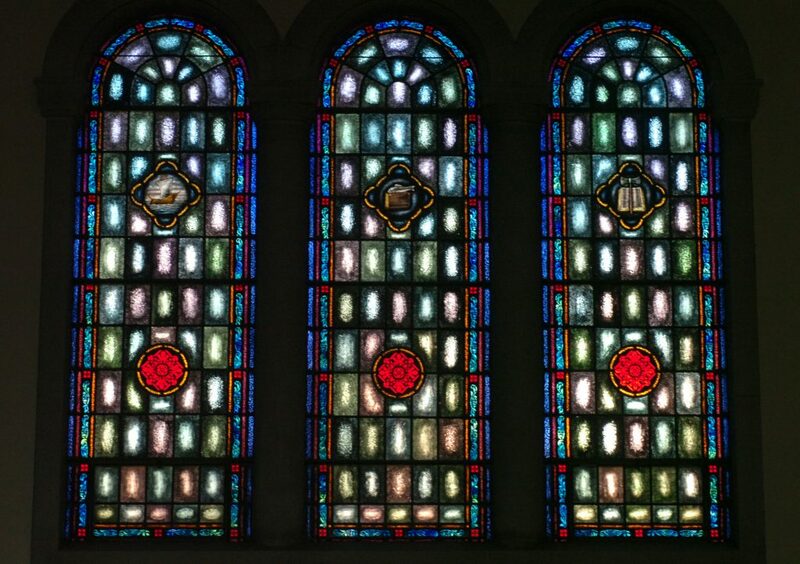 Lilies and Square – (left window above the south confessional). The lily is the flower most shown in most pictures of St. Joseph. The square is a tool used by the builder. 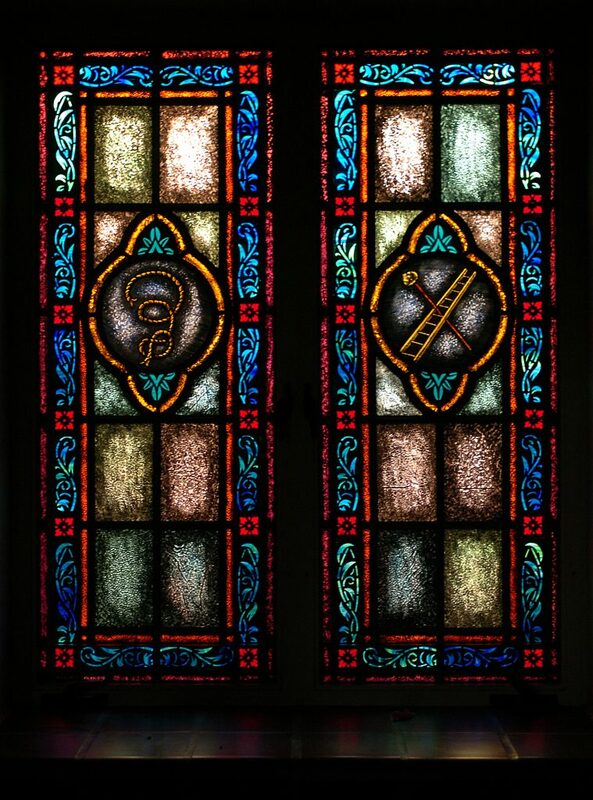 Hatchet and Saw – (right window above the south confessional). Tools associated with carpentry. St. Joseph was a carpenter by trade. St. James – A pilgrim’s staff, dexter (dexter refers to the way an item is positioned on a shield), a pilgrim’s hat, and the initials “S.J.” meaning St. James. St. John – When shown as an Apostle rather than among the Four Evangelists, St. John’s most usual shield shows a chalice with a serpent. Early writers state that an attempt was made to kill this Apostle by giving him a poisoned chalice, from which the Lord spared him. So the shield has the chalice and serpent. St. Andrew – The two fishes, crossed like the letter “X,” recall St. Andrew’s former occupation as a fisherman, his call to be a fisher of man, and his martyrdom by crucifixion on an X-shaped cross. St. Philip – A tall, slender cross, and two loaves of bread, recalling St. Philip’s remark when our Lord fed the multitude (Jn 6:7). St. Thomas – This shield shows 2 spears, or lances, several arrows, and 3 stones. In St. Thomas’s martyrdom he was stoned, shot down with arrows, and left dying alone, until a pagan priest finally killed him with a spear. St. Bartholomew – An open Bible and a flaying knife: these recall the Apostle’s faith in God’s Word, and his martyrdom. St. James the Less – The 3 stones recall this Apostle’s martyrdom by stoning in Jerusalem. St. Matthew – St. Matthew’s usual shield has 3 purses, referring to his original occupation as a tax collector. St. Simon – The companion of St. Jude on many of his missionary journeys, St. Simon is most often represented by a book with a fish laying on it; because he was an outstanding “fisher of men,” through the power of the Gospel. St. Matthias – This apostle, who was chosen to take the place of Judas, is often substituted for the traitor in representations of the Twelve Apostles. His shield shows an open Bible. St. Matthias had accompanied Jesus and His disciples “during all the time that the Lord Jesus went in and out among [them], beginning from the baptism of John until the day when he was taken up from [them]” (Acts 1:21-22); thus, like an open Bible, he could become a witness to the entire mystery of Jesus – His public life, passion, death, resurrection, and ascension. 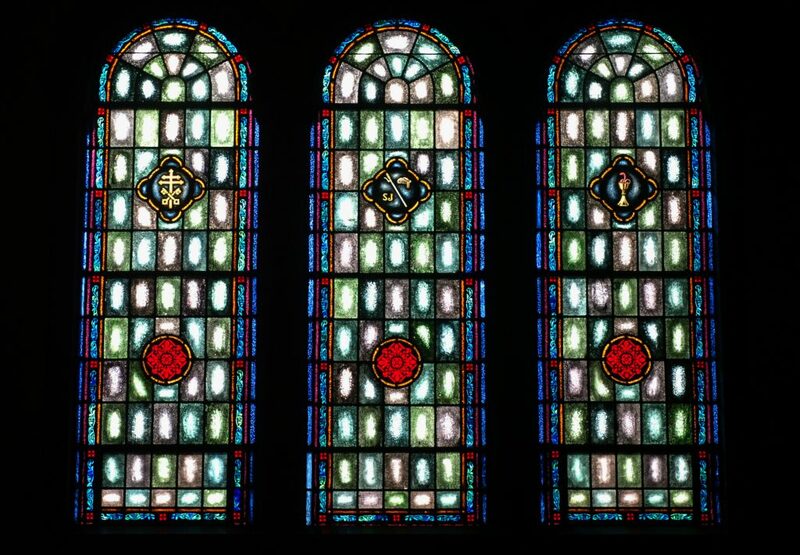 The Smaller Windows around the Church all show symbols of different aspects of the Lord’s passion. Crown of Thorns – This is a very well known symbol. Sometimes the crown is showing alone, but here it is shown with the letters INRI within (which stands for “Jesus of Nazareth, the King of the Jews,” Jn 19:19) and three nails thrust through it. A Pillar – A symbol of the trial and condemnation of Jesus Christ. It is a pillar with a base and capital and with a large ring fixed some distance above the floor. It is supposed that the Lord was tied to such a pillar when He scourges by order of Pontius Pilate. Whips used in the scourging are also shown. The Chalice and Cross – The agony in Gethsemane is almost always depicted by a jeweled chalice out of which is rising a small, red cross with pointed ends. This is the Cross of Suffering. 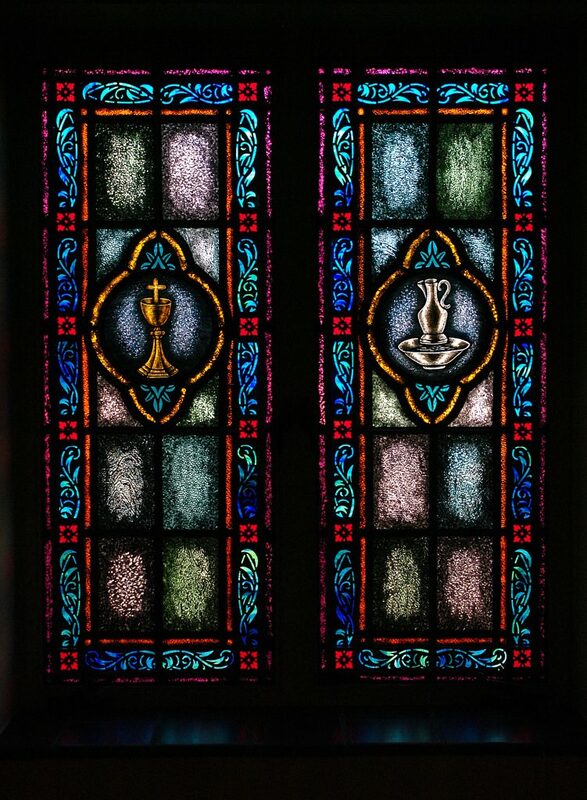 The chalice and cross in our window are both gold in color. It is the “chalice” that the Lord must Drink, which He mentions in HIs prayer in the Garden. The Ewer and Basin – A basin with water and a ewer refer to Pilate’s act of washing from his hands the “blood of Jesus” (the responsibility for Jesus’ death). Rope – A rope was used to bind Jesus when He was led away to Annas and Caiaphas, and is one of the familiar emblems of Jesus’ betrayal and arrest. Ladder and Reed – A ladder with the reed and sponge is saltire also refers to the crucifixion. Jesus said He was thirsty and was given vinegar to drink. The reed was used to lift the sponge to Jesus’ lips.